Embrace creative sensory play with the 'Weenotes Ensemble' outdoor musical instrument collection. The ensemble includes the Piper Marimba, Merry Metallophone and the upright Griffin Metallophone. All the instruments are tuned so that everyone, regardless of their musical skill level, can play together—all the tones flawlessly unite to produce a balanced, lyrical style of music. Additional Individual Componets are Sold Separately. These extraordinary interactive art sculptures work as educational tools to challenge the imagination by stimulating creativity. Ideal for areas where space constraints are of concern, this price saving package is designed for all ages and abilities, available in 'Toddler' and 'Adult' finish heights. 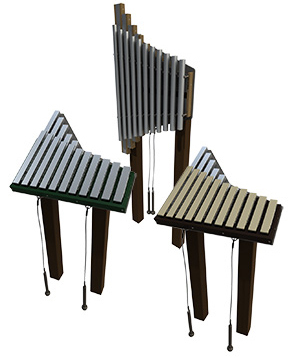 Ensembles instruments are configured for in-ground mount installation, the recycled plastic post mounts are factory cut for Adult or Toddler 'Finish Height'. The posts are ready for subgrade installations with 36" length for frost depth. Actual Post Length = Finish Height + Frost Depth. Post can be easily cut to custom height in the field.